San Francisco CRE News: Potrero Hill Housing Project Shrinks as Vote Looms | Calco Commercial, Inc. Surrounding the Anchor Steam Brewing Co. headquarters in Potrero Hill, the real-estate equivalent of a late-night bar brawl has been raging in the neighborhood. Most major residential projects proposed for Potrero Hill are in the melee, but developer Related California is trying to rise above the fray a block from the brewery at 1601 Mariposa St. Related California sliced the number of rental units in its controversial Potrero Hill apartment proposal by 7 percent and boosted the percentage of affordable housing as it stares down a date with the Planning Commission next month. 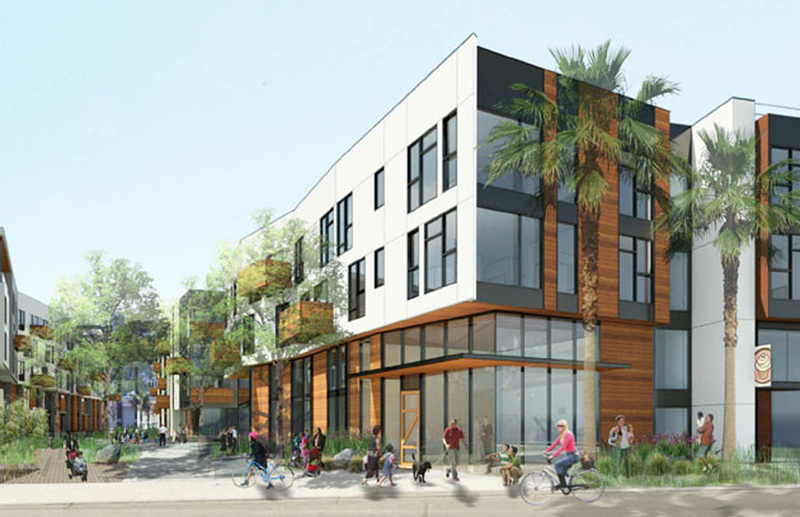 The 1601 Mariposa proposal — two four-story buildings pitched three years ago to replace a warehouse and parking lots on the northern slope of Potrero Hill — shrunk its project from 320 units to 299 units after criticism from neighborhood groups that the apartment would crowd the neighboring Live Oaks private school. The developer also set aside 20 percent of the project for people making about half of the city’s median income instead of the initial required 14 percent. The project includes 28,000 square feet of public open space, and the developer has mulled another increase in the number of three-bedroom units to draw more families to the neighborhood. To help ease traffic, the project will swap out some retail space for workspace that will house small manufacturers. It would be one of the largest built in the neighborhood in recent memory and is part of a string of dense development there, including the 395-unit 1200 17th St. and the 234-unit 1301 16th St. The 1601 Mariposa project – designed by David Baker Architects – already mostly conformed with current zoning under 2009’s Eastern Neighborhoods Plan. A city environmental study found the project would have significant and unavoidable traffic impacts at just one of 13 intersections studied – Mariposa and Mississippi streets. Combined with other projects that are in the development queue, the intersection of 16th and Arkansas streets will also get squeezed. Muni congestion would be insignificant, the study found. A group opposed to 1601 Mariposa, called “Grow Potrero Responsibly,” has said that the project would further congest Muni, provide insufficient parking and would be too dense for the neighborhood. The site is also zoned “urban-mixed use,” a designation that allows for flexible use and has paved the way for housing to replace production, distribution and repair (PDR) businesses. J.R. Eppler, who heads the Potrero Boosters neighborhood group, said he only had quibbles with the project and that much of the large differences had been resolved. The group will vote on endorsing the project Tuesday. The census tracts surrounding the 1601 Mariposa project include median household incomes that are about double the city as a whole and that also have much higher home-ownership rates. The neighborhood is attractive to builders not only for its zoning but for its proximity to technology and biotech headquarters in South of Market and Mission Bay. While few projects have been completed so far, the Potrero Hill/Showplace Square plan area includes 19 percent of the city’s total units approved for construction, according to the city’s Housing Inventory report. The Planning Commission is due for a briefing on the Potrero Hill/Showplace Square plan area this Thursday. Meanwhile, developers fighting against a proposed moratorium on market-rate in the Mission District have feared a similarly drastic measure in Potrero Hill. Eppler of the Potrero Boosters said neighbors aren’t mulling a moratorium but want the Planning Department to re-evaluate the Eastern Neighborhoods plan as it “reaches the end of the pipeline” of construction planned there. “There needs to be the political will necessary to devote a significant amount of resources to Potrero Hill, Dogpatch, Mission Bay, South Beach and to connect dots of development to implement new systems that will allow them to operate together,” Eppler said. San Francisco CRE News: New Office Addition to SF Skyline?